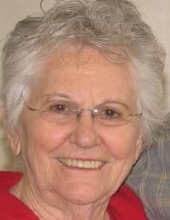 DURHAM -- Margaret Barbee Leahy, 91, passed away Saturday, April 6, 2019 at August Estates at Umstead Pines, Durham. Born in Chatham County, Ms. Leahy was the daughter of the late John Vossie Horton and Cora Lee Farrar Horton. Mrs. Leahy was also preceded in death by two husbands, William John Leahy and Roy Odell Barbee. She was a retired accountant with UNC Medical Center. Ms. Leahy is survived by two daughters, Susan Barbee and husband John Beverly, Kathy Shuping and husband Jim; grandchildren, Breean Gates, Justin Gates and wife Jennifer, Chelsea Kirk and husband Aaron, Ellen Tuck and husband Dustin; and six great-grandchildren. A memorial service will be conducted 2 p.m. on Saturday, April 13, 2019, at Martha’s Chapel Christian Church, Apex, with Rev. Bob Brinson officiating. To send flowers or a remembrance gift to the family of Margaret Barbee Leahy, please visit our Tribute Store. "Email Address" would like to share the life celebration of Margaret Barbee Leahy. Click on the "link" to go to share a favorite memory or leave a condolence message for the family.